The Kaufman Football Building contains nine coaches offices, the team locker room, a training room, an equipment room, and a large team meeting room. 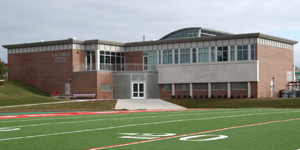 The Kaufman Football Building opened in August of 2000. It was first building at Illinois State in 143 years to be named for a benefactor. Fred and Donna Kaufman contributed $1.5 million for this facility, which is the largest private gift ever designated to the Illinois State Athletics Department. Fred Kaufman received his bachelor’s degree from Illinois State in 1969 and his master’s in 1972. Since 1982, he has been owner, operator, president and CEO of Omni Restaurants, Inc. Donna Kaufman received her bachelor’s degree from Illinois State in 1970. A former schoolteacher, she is also active in the restaurant business.